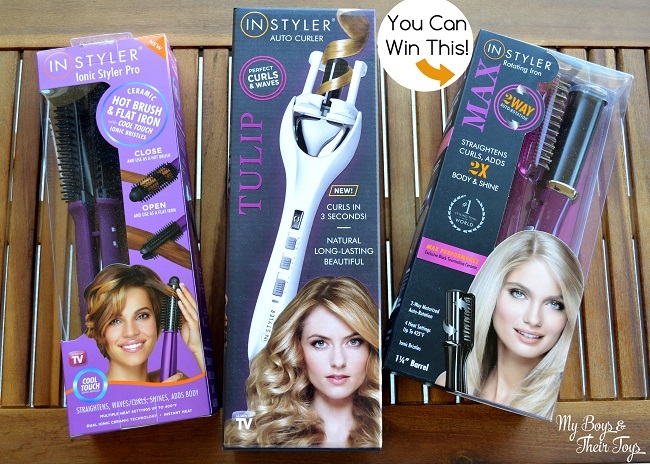 InStyler Hair Tools + Discount & Giveaway! 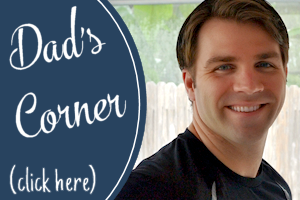 A big thanks to InStyler for sponsoring todays post! All opinions are mine alone. Check out this mega pack of InStyler hair tools! There’s something here for every hair type, whether you have fine, wavy, or curly hair. And many of these hair tools have multiple purposes, making it super convenient while eliminating the use of several products. Pretty cool, right? 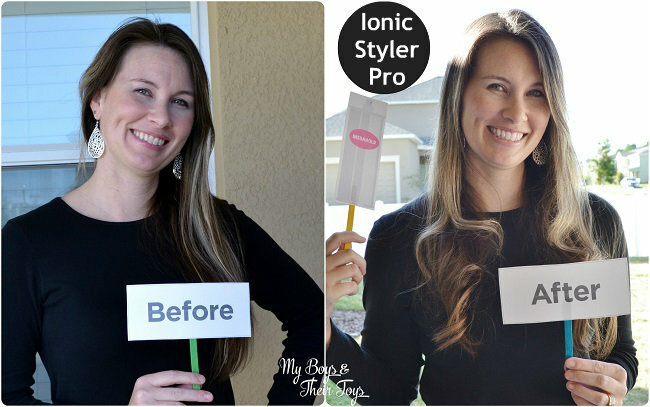 First up is my review of the Ionic Styler Pro – a ceramic hot brush and flat iron – in one! Check out my before and after pics below. I know I’m typically behind the camera, but it was nice to have a girls day and focus on some girly things – like hair! I never leave my house without make up, but my hair is another story. It’s fine and very straight, making it difficult to do anything fun with it. However, with the help of some awesome hair tools, I’m giving my hair new life. 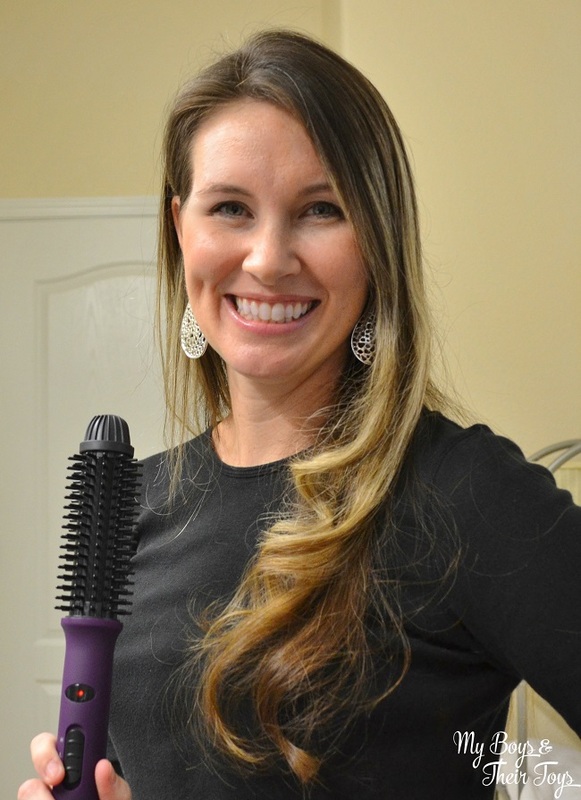 I chose to use the InStyler Ionic Styler Pro as a hot brush for beachy curls. 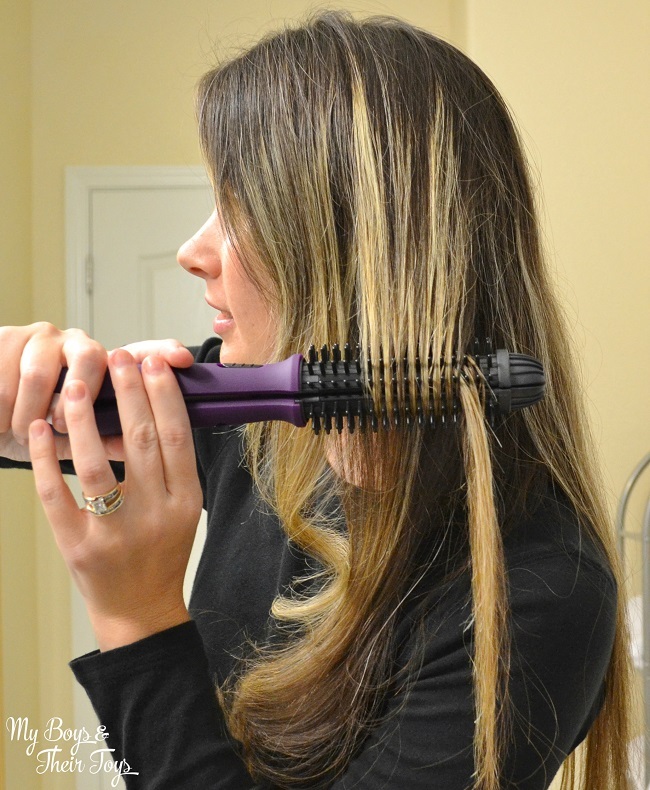 The hot brush was ready to use in no time so I switched the button to lock it in position then began styling. To get a softer style and add shine, InStyler recommends brushing through your hair (slowly) with the hot brush first. This will help with detangling as well. Next, I made a c-wrap with a section of my hair around the barrel and began sliding through my hair, while rolling it until I reached the ends of my hair. Once I reached the ends of my hair, I had a soft beachy curl. I repeated this step from left to right around my head. I was really happy with the outcome. My husband said this was his favorite look so far! This multi hair styling tool works with all hair lengths and naturally straight, wavy, or curly hair. It’s regularly priced at $79.99, however with code: SAVE30 you can buy it for a discounted rate of just $55.99! 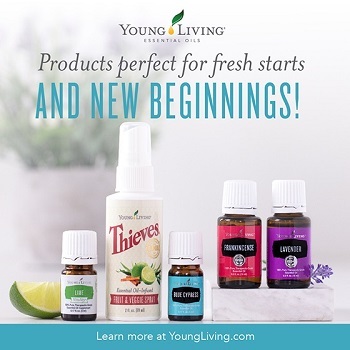 Talk about a fantastic gift idea! 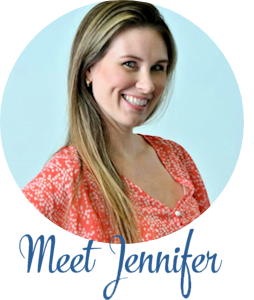 As I mentioned above, I received three hair tools from InStyler, so I invited fellow blogger Lee at My Sentiment Exactlee over for a girls day. 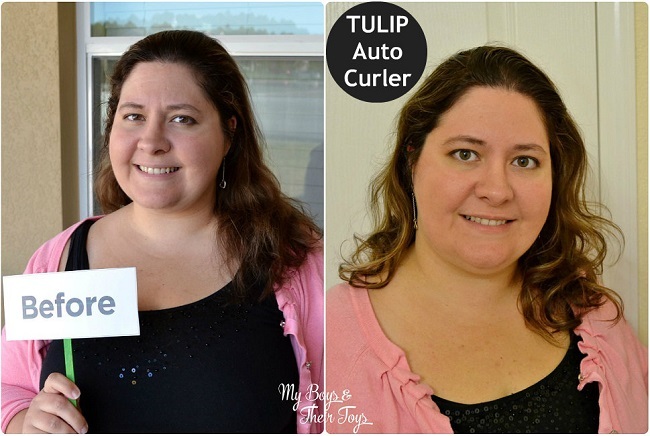 She chose to try out the TULIP Auto Curler. Check out her before and after pics below. The InStyler TULIP is an easy to use curler that works well for naturally straight or wavy hair with thin or medium texture. Again the styling tool was ready to use very quickly and Lee got to work curling her hair. 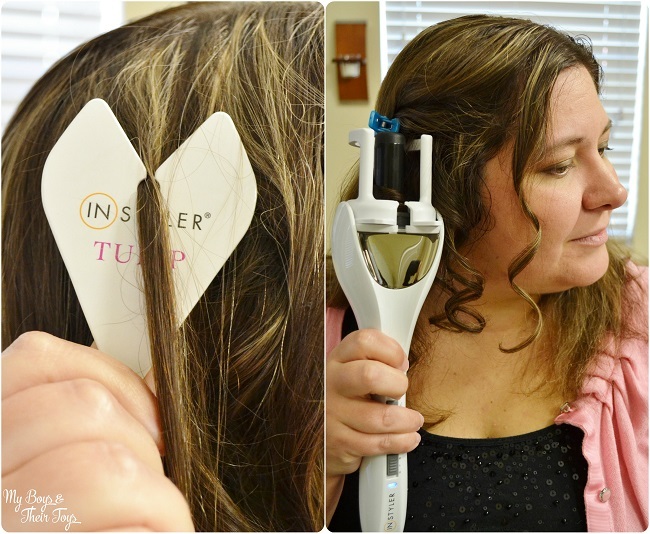 The TULIP comes with a handy sectioning petal that helps you determine how much hair to use with the curling tool at once. Lee then placed that section of hair into the opening of the unit and held the hair to the side, then pressed the rotation button. The hair wrapped around the curling unit and after three beeps it was ready, releasing a beautiful curl. This styling tool works well for naturally straight or wavy hair with a thin to medium texture. It’s regularly priced at $99.99, however with code: SAVE30 you can buy it for a discounted rate of just $69.99! Now that is a deal! The third InStyler product I received was the MAX 2-Way Rotating Iron – great for straightening, volume, shine, controlling frizz, texture, and speed. The styling tool works well for all hair types and textures, and is most transformative for thick and curly hair. It’s also priced at $99.99 regularly, however with the code: SAVE30 the price is reduced to $69.99! This code is valid on up to 2 InStyler tools and good through 1/31/15! It’s the season of paying it forward or giving back, however you look at it. 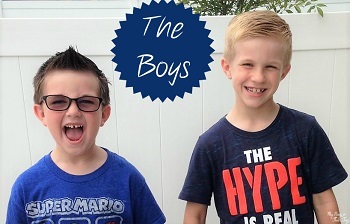 🙂 So I’ve decided to give away the unopened/brand new InStyler MAX to one lucky My Boys and Their Toys reader! Enter below for your chance to win an InStyler MAX 2-Way Rotating Iron! 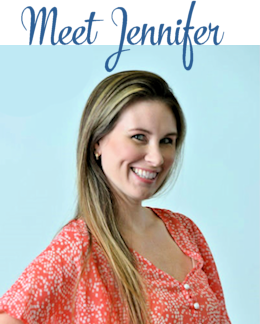 It would be for me, I have a permanent injury in my left wrist, and got a neck injury on the right in a car accident this year….anything that makes doing my hair easier would be amazing! I’d like to win for myself….house full of boys, I’d don’t take too much time to do much styling. Would love to try the curler. I’d give this to my sister! I would give this my daughter. I would give it to my daughter in law. It would be for me. I have curly hair but it’s always out of control! This would be for my daughter. She’s always styling hr hair. I would love this for myself. Although I’d love to keep it, I think it would be a great gift for my mother, I know she’d like it. I would love to have these as a gift to myself! These would be so nice on my hair! This would be a gift for me and my daughter. I love hair tools. I would give to someone as a gift. This would be a gift for my daughter and granddaughter. If I won, this would be for my step daughter. I would love this for my daughter and who isn’t lying for me too! This would be for me. Thanks for the chance! Would love this for myself to try out – great pics of the before and afters! I would share with my sister…….great tools. I seriously want that brush curler and the Tulip! Or is that too much? Nope, you can never have too many hair stylers. Ever! Love the before and after pics! I think I’d keep this one. My curling iron literally just broke yesterday! 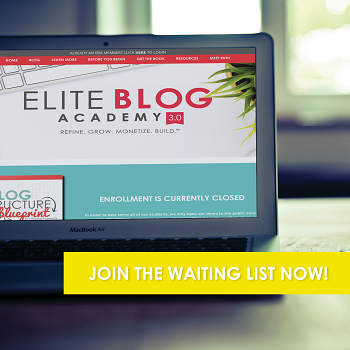 I would love to win this for myself! This would be for me and my girls to share. This would have been great to have during our prom incident last year. bad hair, lol. I would keep it for myself. My hair needs all the help it can get. My teen loves doing her hair. She would love it. This would be a great gift for my daughter. Thanks for the chance. This would be for me I need this! I would keep this for myself – my hair is straight and a little curl would be a fun style to wear. I will use it but mostly for my daughter.. I would share it, it looks awesome! Is it safe for hair extentions??? I would keep this for myself. It’s high time I upgrade from my usual “long hair in a ponytail” style. If I won, I would give this to my daughter. She is always having fun working on hair styles. This would be for my daughter but I would give it a try myself. For me. I would love to curl my hair. This would be for me to deal with my horribly curly hair. I would give the firs 2 products to my sister in law, i think they would work perfect for her hair. I would keep the 2-way rotating iron for myself to use on my thick wavy hair!